Hypertension, known as high blood pressure, more often affects one of every three adults in the United States. Hypertension affects about 70 million of adults in America. The primary or contributing cause for thousands of deaths in America is high blood pressure. 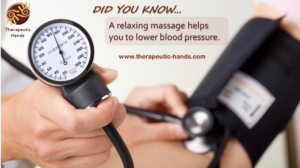 Did you know that hypertension and its associated symptoms are reduced with massage therapy? Hypertension often goes unnoticed, since there is no apparent external symptoms associated with the disease. Adults with hypertension should try to reduce their experience of stress in order to avoid increases in blood pressure, for this reason, massage can be beneficial for hypertension. Massage can help relax tight, aching muscles, improve range of motion in joints and circulation and lower stress levels. It is a safe, noninvasive, and soothing for hypertension, especially for people who experience stress frequently. If treated regularly, therapeutic massages can help in giving you a long-term improvement in stress levels and heart rate. Studies show that patients experience a reduction in muscle tension and the blood pressure, as a result of massage therapy; as well as a reduction in feelings of depression, less hostile behavior and reducing cortisol levels in their urine and saliva. Many people do not realize the damage high blood pressure can cause and the risks on our health. If it goes uncontrolled, it can lead to disabilities and fatal heart attacks or strokes. A regular massage regimen can reduce the risks associated with stress. Before attempting massage therapy, first consult a primary care physician. If the doctor advises that massage may help, contact me so we can schedule your appointment and you can relax completely by getting a massage in the comfort of your own place. You can send me an email or contact me at phone number (786) 290-7055 by calling or sending a text message. Invest in your health, Invest in yourself. I’m Angela Lind, licensed massage therapist in Florida with over 13 years of experience. I provide mobile massage and lymphatic drainage in South Florida: Fort Lauderdale, Weston, Plantation, Cooper City, Parkland, Boca Raton, Coral Springs, Miramar, Pembroke Pines, Miami and nearby areas.